In the most recent financial letter sent to all parishioners, the rebuilding of the parish and school parking lots was discussed. 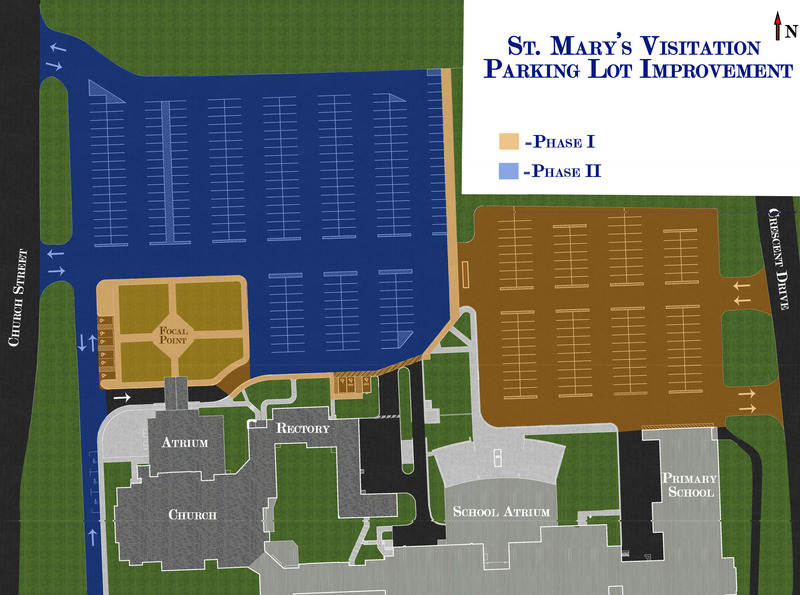 Due to all who have so willingly and faithfully contributed to our Debt Retirement Appeal, as well as the strong financial position of the Parish and the recommendations of our Building and Grounds Committee, Finance Council and the Parish Trustees, we are moving ahead with our intention of rebuilding the St. Mary’s parking lots over the course of this summer. With a project of this size there are sure to be questions, please consult this guide to gain a deeper understanding of the need for this project, as well as what things will look like during the reconstruction work and in the parking lot going forward. Why do we need a new parking lot? Our current parking lot is older than its intended life, in many places it is easy to see broken and uneven pavement and even holes in certain places. This broken and uneven pavement leads to safety concerns with the dangers of tripping and falling, becomes a problem with damage to snow plows, and has led to grass beginning to grow through the parking lot, particularly in the northeast corner where part of the lawn care during the summer means actually mowing the parking lot. Furthermore there are traffic flow problems with cars entering and exiting the lot as well as safety concerns with the school children walking from school to the church and the drop-off and pick-up cycle of the school buses. Being significantly past its useful life, the parking lot was originally part of the addition projects in 2009, but was deferred due to budgetary constraints. What will the new lot look like? Rebuilding the parking lot gives us the opportunity to not only address significant safety concerns, but also allows us to make the parking lot more intuitive and both car and pedestrian friendly. The new lot will also reconfigure the parking spaces to make for a safer walk from the lot to the church, it will make a designated bus drop-off route and also allow us to include new green space. When the Atrium was built, green space was lost on the north side of the church; the new parking lot will allow us to rebuild that green space leaving a space for gardens and gatherings after Mass. The aesthetics of our lot will be significantly enhanced by this addition. It will also include more than the required number of Handicapped Accessible Parking Spots as well as move a few of them closer to the front entrance of the church. How will we park during the reconstruction? The rebuilding of the lot is expected to take place in phases and will be accomplished as speedily as possible limiting the disruption to parking, particularly for Sunday Masses. Weather permitting, the work should begin in July and will be completed by the time school begins. It is possible that there may be a time where people will have to park a bit further from church, however, our goal is to limit this necessity and the work will hopefully proceed quickly and efficiently. How is the project being paid for? As you may remember, when the Debt Retirement Appeal was launched in May of 2013, the reconstruction of the parking lot was part of our original hopes for the outcome of the appeal. Thanks to the generosity of St. Mary’s parishioners in both their pledges as well as their fulfillment of those pledges, St. Mary’s is in a position financially to accomplish this work now as well as continue to pay down the debt from the 2009 building campaign. The parish will have a decreasing amount of debt for the next few years, but will also be able to continue to enjoy the gifts of the 2009 building projects, as well as a new parking lot and enhanced green space. What can I do to help? The first thing we would ask for is patience as the project unfolds. Of course construction projects mean a disruption to our normal patterns, but the disruption will be limited and the resulting project will be a tremendous gift and asset to the entire parish community. Secondly, we would ask for the continued generosity of all our parishioners in both their contributions to the Debt Retirement Appeal and their weekly offerings. It is your generosity which directly affects our ability to continue to improve the life of the parish. Timely or early fulfillment of your Debt Retirement Appeal pledges will save the parish money by reducing bank interest expense on our loans. If you are new to St. Mary’s or did not have a chance to pledge or contribute to our original Debt Retirement Appeal, now may be a time to consider making your contribution, whether in the form of a monthly commitment or a one-time gift. Finally, if you have a particular interest in helping with this project, money donated can be used specifically to help us complete this project. For instance, someone may desire to help offset landscaping costs, a donation can be given to this specific purpose. Your generosity helps this parish to remain financially strong so that it may be spiritually strong. Note: All dates are tentative and subject to change based on weather and contingencies.